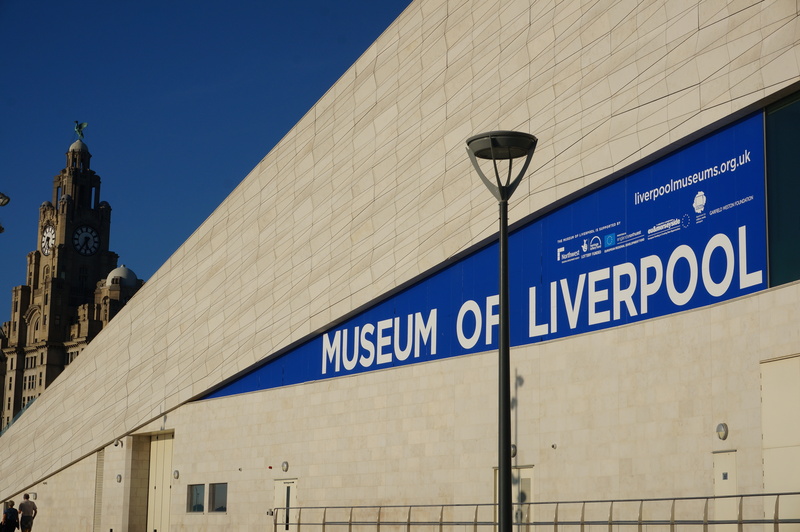 I have just got back from an exhausting but excellent research trip to Liverpool where I have been immersing myself in the history of youth clubs and youth work as well as getting to know the city a little better. On the second day, while visiting a club whose papers I have read, I was reminded of Lucie Matthews Jones Blog ‘A Walking Historian’ in which she describes the connection that walking can give her to her research. Having spent time this week exploring the spaces in and around some youth clubs in Liverpool I have felt a little of what Lucie describes in her blog. I understand better how the spaces clubs occupy shape and have been shaped by the City, its history and its people. This in turn gives me a different appreciation of these places when I see them discussed in documents. They are not passive, static buildings and streets. They have an active, dynamic role to play in shaping the young people and youth work histories of Liverpool. On the first afternoon, after one interview and a meeting at the Merseyside Youth Association I went to the Albert Dock and Pierhead area of Liverpool where I was struck by the contrasts of old and new: the Liverpool Museum Building and Western Railway, regenerated Maritime and Slavery Museum Buildings, the old docks with the new Liverpool One centre behind them. It made me reflect on the economic history of Liverpool: how recently the City has regenerated these areas and why they were not done earlier. It echoed stories told by several of my interviewees about the scale and effect of poverty in Liverpool in the 1970s and 1980s, the anger and frustration felt at the time, the spaces it left in the City, and the pride they have in Liverpool’s more recent additions. On the second day I found some time to go and visit a Youth Club I have been reading about in the archives. The Bronte Youth and Community Centre was developed as an experiment in the early 1960s in the wake of the Albemarle Report into the Youth Service in 1960. It was in an area of Liverpool, close to the City Centre, seen to have little to offer young people in an area of poor quality housing. St Andrews Gardens (also known as the Bullring area) makes an impression when you come upon it. 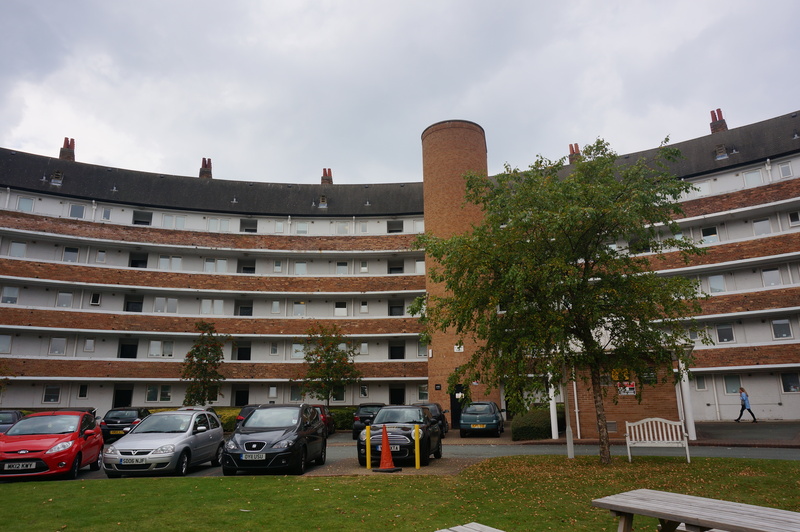 It is large and round and many of the flats face into the central courtyard. It feels enclosed and a little imposing. Opposite the ring, which is directly behind the camera in the photograph below, is the Bronte Centre. It bears a direct physical relationship with the area it was designed to serve: they face each other across a road. The Bronte originally occupied three empty shops and was designed for young people themselves to shape and develop. Now it serves a much wider purpose for the whole community, not just young people. 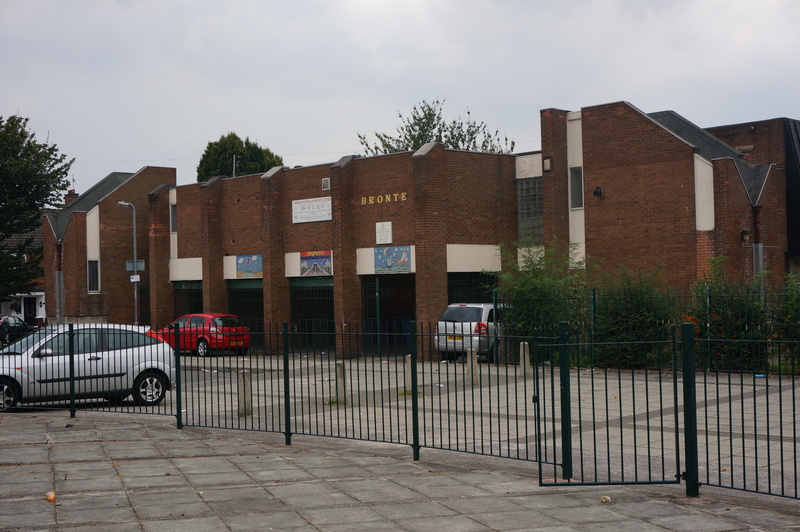 This has been driven in part by the local community demand for its wider use since the 1970s, realised when the facility was redeveloped a few years later. 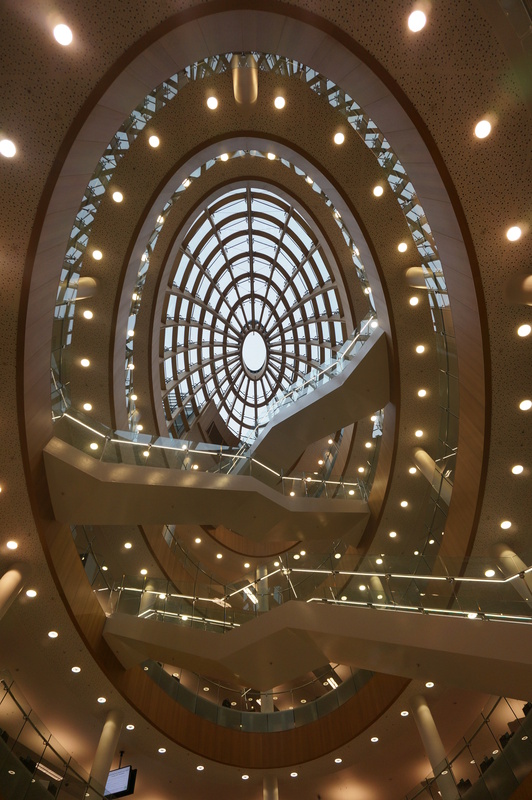 During the course of the week, the spaces I worked in, (such as the new Central Library and Records Office), Shrewsbury House (on which more in another post) and the places I travelled to conduct interviews, helped me feel my research coming off the pages and out of the interviews. 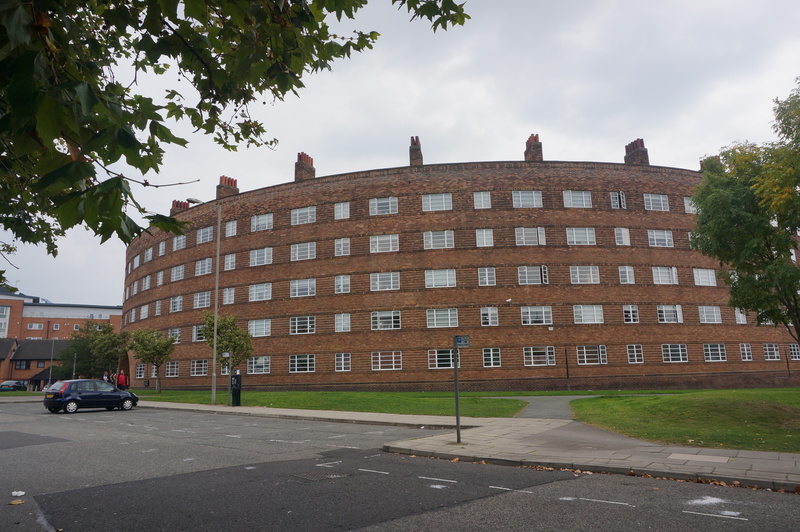 I could see how buildings and spaces had the potential to affect the young people that used them: the sizes of the terraced houses, the areas totally cleared and redeveloped. Parks which lay flat on maps in fact banked steeply offering views over the City to the river Mersey. Anfield and Goodison Park loomed, Breck Road bustled. To give one example of space helping me make sense of my research, I walked down the road where the offices of the Liverpool Union of Youth Clubs used to be. Seeing this street in the centre of Liverpool made it clear why two interviewees had said that the Liverpool Union of Youth Clubs was one those places you might ‘pop into’ when passing to chat to one of the staff. It is central. The location lends itself to doing business in person and therefore acted as a local focal point for some of the youth work in the City. The same could not be said of the Liverpool Boys’ Association whose office was out of town on Shiel Road. For a lot of the time that I have been doing this research I have had the feeling that the stories of many Youth Clubs and Boys’ Clubs would only really make sense in the context of local spaces and local places. It has been encouraging to find my intuition from documents confirmed by how I experienced the spaces being written about. It has also been stimulating to have my reading of documents challenged and totally reoriented based on walking around Liverpool, interviewing people and going in the buildings used for youth work in the City, past and present. Yet somehow, despite this deepening understanding, I also feel like I have barely scratched the surface. There are more documents and stories of young people and youth work here than I ever could have imagined. I am looking forward to further roving archive visits, but more than that I am looking forward to talking to more of the people I met and walking the streets around the clubs and projects tentatively revealed in documents to date. Offices of Merseyside Youth Association, current incarnation of the youth organisations in Liverpool which I have been researching.